When most people think of oak porch styles they are most likely to find themselves picturing the Deep South of America. Those Southern mansions with wide, deep, open-planned porches are, perhaps, the archetypal expression of an entrance that becomes a living space all of its own. Yet, the porch has a fascinating history in the UK, too – and if you are looking to add an oak porch to create the perfect entrance to your home there are many styles to choose from to match and enhance your home’s exterior. The word porch ultimately derives from the Latin porticus (colonnade) or porta (passage) by way of the Old French porche. By the early Middle Ages, porches were being widely used in the UK in religious rather than domestic architecture. Typically, they covered the southern entrance, but they were also often placed over the western and northern doors too. Many of these used timbers such as oak in their construction. Tudor and Stuart homes rarely featured porches – although the overhanging thatch of Tudor homes offered some degree of shelter to the entrance area. Porches in Georgian homes offered the only real ornamental element of their perfectly symmetrical facades. Early 18th century porticos were made with heavy brackets supporting a hood, but later designs based on temples were used for door cases with pillars supporting the roof cover. 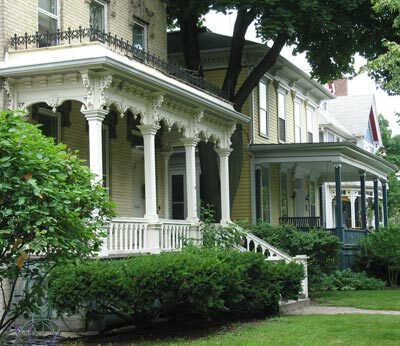 Victorian and Queen Anne-style town houses preferred more ornamental porches with graceful curves and architectural embellishments – but these tended to be made of brick or stone-work rather than oak. Timber porches came back into their own in the Edwardian period. During this time the Arts and Crafts movement focussed on homes with timber framing, pebbledash, hanging tiles and white-painted timber porches, verandas or balconies finished in decorative tiles. In the 1930s Arts and Crafts still held sway but porches tended to be recessed and made of brick rather than timber. The pebble-dashed walls, recessed porches and mock timber framing of the 1930s semi – and its hipped roof and curved bay windows – continue to exert popular appeal today. The modern period saw houses being built to echo many historic styles but featuring modern comforts such as wrap-around or façade-length porches. An open or enclosed porch? When deciding on the style of porch that’s right for you the first thing to consider is whether you want an open, partially enclosed or fully enclosed porch? A fully enclosed porch will stop all the heat escaping from the house on wintry days and can be a handy store for all those coats, galoshes and football boots that pile up in the hall. Open porches, however, allow you to create a stunning entrance to your home and provide you with a wonderful indoor-outdoor space to enjoy. Not sure what style of porch to choose? 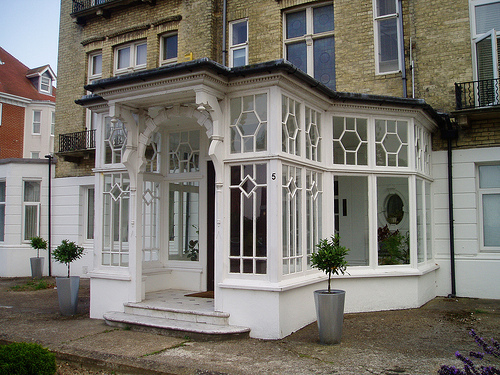 Why not get inspired by our galleries of oak porches – and then give us a call to talk through your ideas? Our team is always happy to help and can be reached on 01444 455455.